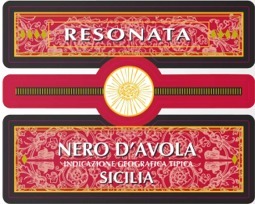 Resonata Nero d'Avola 2015 is made from 100% Nero d'Avola. Vinification: The grapes are soft pressed and the juice is placed in stainless steel along with the skins for a maceration of 8 to 10 days with daily pumping over of the juice to extract more color and sweet tannins. The must is then racked and lightly filtered. Fermentation then takes place with selected yeast under controlled temperatures. The finished wine is placed in stainless steel holding tanks and bottled on order. Lush and ripe bouquet full of mulberries, blackberries and spice. Harmonious and well balanced with good berry fruit in a spicy background. Food paring: Excellent with lamb, grilled and barbecued meats, dishes with olives or capers and seasoned cheeses. The wine is produced at Casa Vinicola Botter, a family owned winery founded in 1928 and run today by the third generation. High density vineyards located in the provinces of Agrigento and Caltanissetta in southern and central Sicily. Vines are trained on “alberello” (bush vines). The soil is a mixture of limestone and clay The climate is dry and windy with average Spring temperatures of 15-20°C and Summer temperatures of 20-32° C during the day. The coolness of the nights and the constant aeration by the wind is optimal for bouquet and color. The relatively infertile terrain encourages the concentrated structure. A gold color; complex aromas of ripe fruits, candied fruit, honey. Soft and well-structured. Southeastern exposure with an altitude of 250-350 meters above sea level. Planting density: 3,500 vines per hectare on average. Training system: espalier with Guyot pruning. Manual harvest in small crates end of September. Winemaking in white in stainless steel tanks at controlled temperature. Pairs well with fresh cheese, pasta with vegetables, vegetable soups.